← Steer Romibo by Tilting the iPad! The fiber optic cables on Romibo’s antennae are not really effective because they are rather dim and face the back. 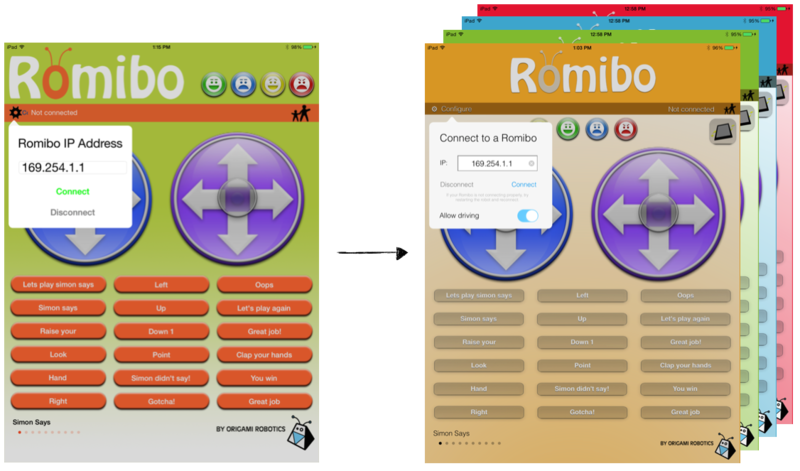 In the new interface I created, the iPad app changes color based on Romibo’s emotion. It conforms to more of iOS Human Interface Guidelines and the iOS 7 “flatness.” It also uses more consistent elements across the app to create a smoother user experience. The mood buttons control the main view’s background color, and interface elements on top have transparency to adapt to new colors. See the screenshots below (the left is the old interface, and the right is the new one). A GREAT idea- again, I never even imagined this, but it makes perfect sense, and looks like an excellent improvement. Could you post a youtube vid showing these two recent improvements? Keep up the good work!